I want to get a histogram of a numerical variable v172 by each value of a nominal value COUNTRY and use the proc EXAMINE. The output on the screen (see capture attached) is cut after the name of the break variable so that you can't know which country is shown. 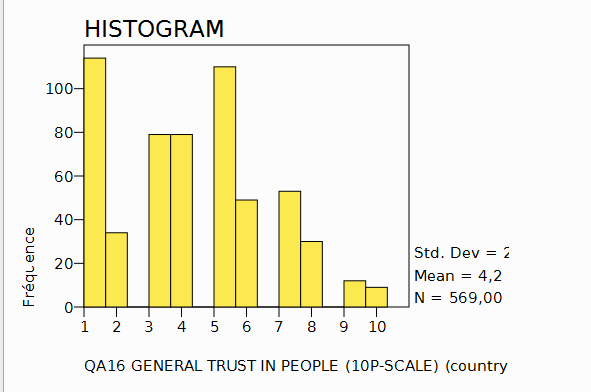 Also, the standard deviation shown to the right of the graphics is cut. You have to export the output which is not a rapid way to visually control the distribution of the dependent variable. Of course, you can first try if PSPP shows everything you need, then delete the variable label, and rerun. But it would be helpful if everything were in place from the very beginning, for instance in putting the level of the break variable under the graphics on a second line.